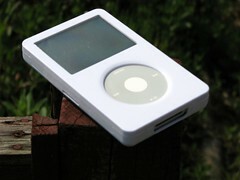 Since the introduction of the iPod, the market for iPod accessories has grown to become possibly the largest for any portable music player, past and present. Vakaadoo are newcomers but by no means inferior, as you will later discover when I uncover the details of this uniquely named iPod case manufacturer. The iVak and Domino series are designed for the iPod with Video 30 and 60GB models. For a company I’ve never heard of and a newcomer to this market, I was initially very impressed! You will find these cases in two ranges; the Domino and Soft Feel series. Available in White, Black, Green and Pink and are made out of plastic. The latter three have a scratch resistant liquid rubber finish which gives the case a soft feel. The white model is again all plastic and has a glossy finish. I prefer this one as it accentuates the iPod styling and remains faithful to the iPod design. The other cases are likewise just as well executed. The cases come in two pieces and leave the click wheel, data port, headphone jack and hold switch exposed for convenient access. The screen has its own plastic protector but doesn’t obstruct the view of the screen. The iVak pieces together like a jigsaw which is unique in that I’ve never seen any other case come together like this. The two front and back pieces clip together very much like a jig-saw and even come with a key to get them to open up. 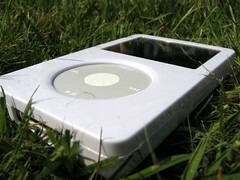 The case is designed to meet the exact size requirements of the iPod with Video and you’ll notice this when you come to place the iPod inside of it. This is good news for those who want to try and retain the slim design of the iPod. 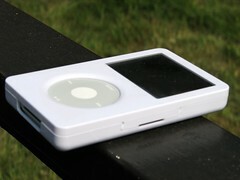 It adds only a few millimetres in thickness to the overall dimensions which is great for those who want to remain faithful to the original iPod design, especially with the white model. The soft feel cases come with the Vakwrap. 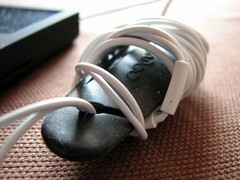 A unique headphone management system ensures tangle free headphone placement when your iPod is in transit and not being used. This is the second case I’ve reviewed with this feature and it’s definitely without doubt a welcome addition. The Vakwrap is a simple accessory that is separate to the case and has plastic inserts for you to wrap and secure your headphones around. A truly ingenious idea. The series has only just been released and there is limited availability at the moment, and the Vakaadoo web-site isn’t up yet. However various reviews have cropped up and more colours are expected to be introduced to the range soon. You can find this case for about Â£20 which is great value for the quality and precision design that you get from Vakaadoo. To round up this review, Vakaadoo have created a quality range of cases that contains form, functionality and elegance all bundled in to one package. The thought behind the cases follow the same inspiration of a slim form factor that adds millimetres to the overall dimensions and continues to carry out its main function; to protect your iPod from every day bumps and scratches. The Vakaadoo iVak range gets the TechCast Recommended award.